What Is So Special about Our Bones? Just How Strong are Bones? Are Limitations Really Good for Us? Our body chassis (skeleton) can do just that. This is because bones are living organs, filled with blood vessels and nerves. Take, for example the femur (thigh bone). This long bone consists of an outer covering called the periosteum. It is made of dense bone tissue. Beneath this protective cover are the osteons, made of mineralized, layered cylinders. These are laced with small, bubble-like spaces containing living bone cells. 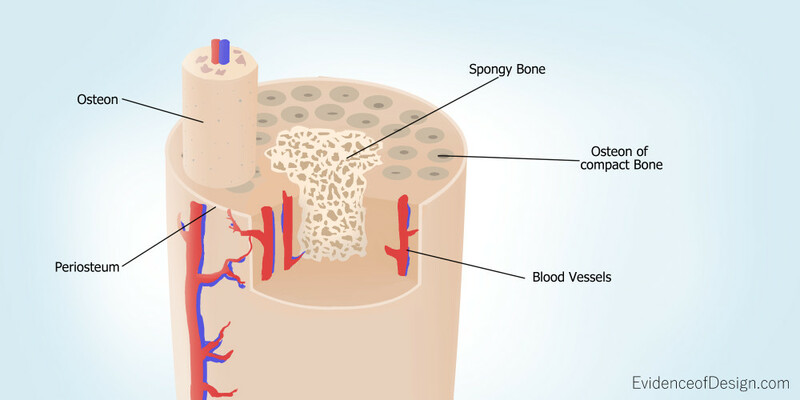 In the center is the spongy bone containing marrow. 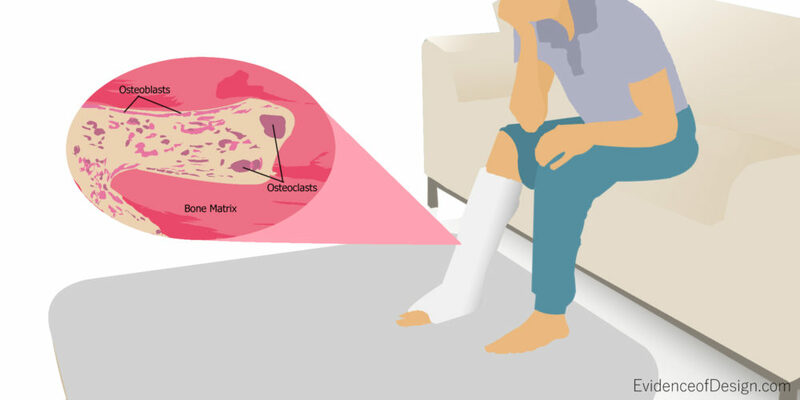 Blood vessels run through the osteon and spongy regions to deliver oxygen and remove wastes. In children, this marrow is actively making new red and white blood cells. However, by adulthood, this job is largely done by the hips, ribs, shoulder blades, breastbone, collarbone, and spinal vertebrae. The long bones then contain yellow marrow which is largely fat. But if the need for a large quantity of blood arises, the kidneys send a chemical signal to these long bones to convert yellow marrow to red marrow to make additional red cells. The structure of a bone is both light-weight and strong, stronger than equivalent steel. But obviously, it can break and severed nerves and swelling cause pain. When a break occurs, an amazing series of events takes place to repair it. The first step is the clotting of broken blood vessels. Then the area is penetrated with blood vessels that were not severed to provide oxygen for the living cells and needed materials for repair. Two types of cells are active- osteoblasts that form new bone cells, and osteoclasts that remove unwanted bone tissue. Thus, the area of the break is built out with a callous, but remodeled eventually to remove any trace of the break. This process, and the bones themselves, all declare to those who are willing to see it that they are designed by an infinitely wise Creator. Though our bones are all internal and, for most of us, no one ever sees them, we couldn’t function without them. Some bones, like the skull and ribs, serve as protectors, while others, like hips, arm and leg bones, support us and give us our shape. Bones are great restrictors. They limit where and how far we can move. For example, we can only move our legs at the hips, knees, and feet. Even these motions are limited by the types of joints we have, but we will discuss these next time. There is a lesson here from our Designer. Limitations are good. They provide structure and greater freedom. Yes, that’s right; limitations provide freedom. Without structural bones, we would be a mass of organs rolling from one place to another. We could move each limb freely but this freedom would result is greater restrictions.